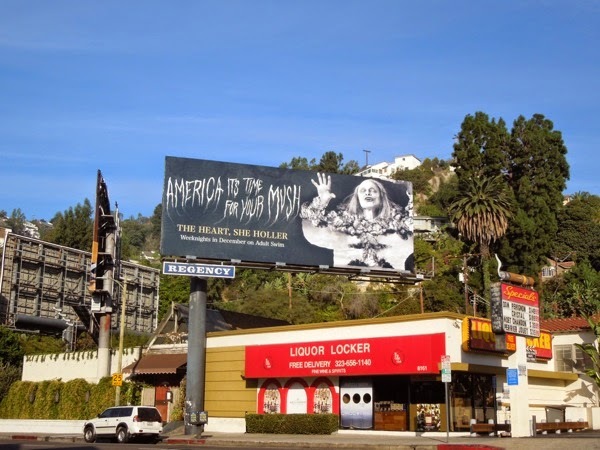 Love it or loathe it, but The Heart, She Holler is back for a third outrageous season on Adult Swim with an equally bizarre billboard to herald its return. The Heartshe clan's ancient 'Meemaw' is back in this surreal ad creative, which looks like a mashup of an evil clown and a nuclear mushroom cloud, which would be more suited to Halloween than this festive time of year. 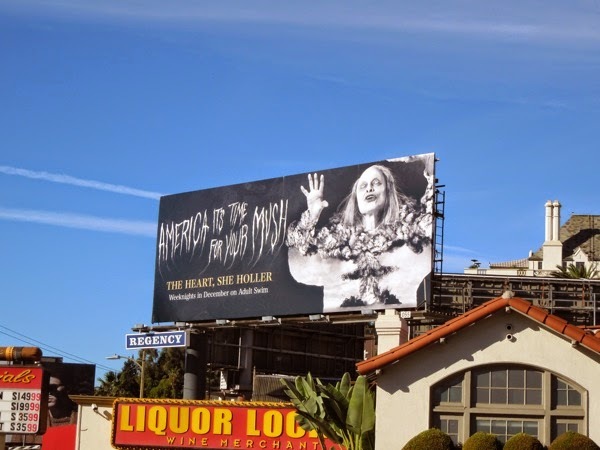 This creepy season three billboard was snapped along Sunset Boulevard in West Hollywood on November 27, 2014. If you're a fan of the live-action comedy series, be sure to also check out this season two billboard for The Heart, She Holler and enjoy more weird and wonderful Adult Swim outdoor ads here at Daily Billboard from years past. America, are you ready for yer mush?